SMA Solar is firing 700 workers from its nearly 4000 workforce, as the company tries to align costs to its falling revenue. The German solar inverter maker is the world’s largest producer and shipper of inverters for the global solar market. The company had a 40% market share just 2 years ago, thanks to the strength of its domestic German market. The company used to sell its inverters at a premium over others and managed high margins. SMA Solar was not affected by the gloom in the solar panel industry, as Asian companies did not have the technological expertise of SMA and other European makers. However, Chinese companies such as Sungrow have managed to improve their quality and reduce costs at the same time. 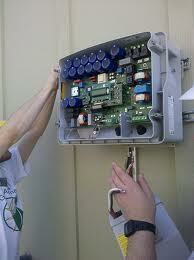 Read on GWI List of Major Solar Inverter Manufacturers. We have predicted in the past that SMA Solar might face the prospect of other German solar companies as solar inverter ASPs go the solar panel way. The Chinese and other Asian companies have entered the fast growing $7 billion solar inverter market in a big way. They have also been helped, as China is set to overtake the saturated German market as the largest demand driver of solar panels. SMA Solar has been trying to curtail market share losses by buying a Chinese inverter company. However, its efforts have not been too successful as it continues to see a double whammy of lower revenues and lower ASPs. SMA Solar needs to make a radical change in its strategy if it hopes to survive the change in the industry. I don’t think it will even manage to keep the current 3000 German workers. The company will need to outsource to other locations, otherwise it might face the fate of European telecom equipment makers. Also Read on GWI Why Solar Inverter Top Dog SMA Solar is Losing Marketshare. SMA Solar Technology AG (S92), the world’s biggest maker of inverters, said it will eliminate 700 full-time jobs in Germany by the end of 2014 as the photovoltaic market it supplies shrinks.